The Draw Ceremony for this year’s Men and Women Federation Cup competitions will hold in Abuja on Thursday. In a statement to the Football Associations of the 36 States and the Federal Capital Territory, NFF’s Head of Federation Cup Unit, Ruth David said the Draw Ceremony will begin at 1pm. Already, all 64 teams for the Men’s Draw and 18 teams for the Women’s Draw have emerged, setting the stage for the colourful event that will herald the national finals of the most prestigious football competition in the land. David has also disclosed that of the 64 teams in the Men’s draw, 19 are Premier League clubs (Warri Wolves the only Premier League cut out after it lost to God’s Time FC in the Delta State preliminaries), 14 are from the second tier National League, 16 belong to the Nationwide League and an impressive 15 are non-League. The two teams that reached the final of the preliminaries in each State and the FCT have been considered, except Yobe State that failed to register any club for the competition. Of the remaining 72 clubs, eight were eliminated in last Tuesday’s play-off round. In the Women’s draw, usual suspects Rivers Angels, Bayelsa Queens, Sunshine Queens, Delta Queens, Ibom Angels, Nasarawa Amazons and Kogi Confluence Queens make the cut. There are four non-League teams in the Women’s draw, namely Golden Babes of Ebonyi State, Moje Queens of Kwara State, Fortress Ladies of Edo State and Alberto Queens of Akwa Ibom State. 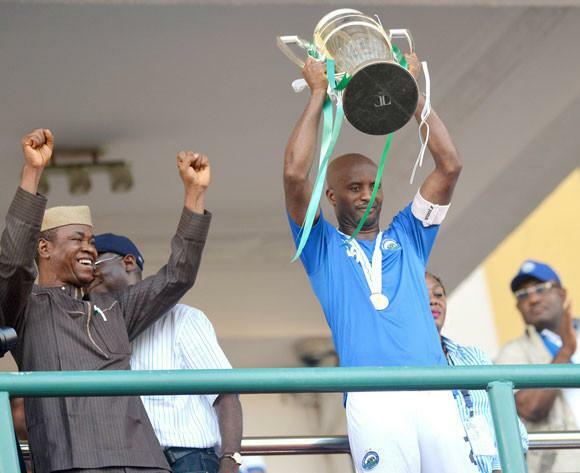 Enyimba FC Defeated Dolphins to Win the 2014 Federation Cup at the Teslim Balogun Stadium in November.